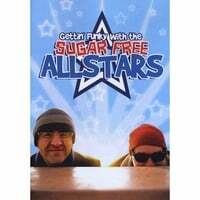 So the funkiest kids' music act known to man (well, at least known to this man), Sugar Free Allstars, has been busy of late... Last fall they put out a live DVD, Gettin' Funky with the Sugar Free Allstars, which really shows off the live energy and musical talent of the dynamic duo. And just the other day they officially released their second CD, funky fresh and sugar free, which picks up where Dos Ninos left off and includes soon to be SFA classics like "6th Grade Band", "In My Pocket" and "Little Red Wagon", as well as a funkified cover of The Beatles' "Ob-la-di". Check out the video for "Rock Awesome" below and click here to order the DVD and the new CD. I had mentioned in my previous post about the Imagination Movers that although I knew of them for several years and enjoyed the few song clips I'd heard of theirs, it wasn't until watching their TV show on Playhouse Disney that they I could really appreciate how great they were. The Monkees style humor and charm of the show and their characters was immediately endearing, but their music in particular became infectious and memorable with every new show. The Movers songs have a terrific mix of accessible and kid-focused original pop-rock, with influences and styles that include driving Cajun rhythms, Red Hot Chili Pepper style funk rap, Mighty Mighty Bosstones, BNL, and various 80's rock staples. It's a great sound, with the four of them taking turns on vocals, and the songwriting and production is sharp and focused and always serves the song and the audience. But as much as I've come to love the band, that couldn't begin to compare to how much my girls love them. New episodes of their show are eagerly awaited, recorded, watched and rewatched several times, with particularly funny moments giving my 7 year-old Becca practice with the rewind function of the DVR remote so she and her sister Evee can watch them over and over and laugh like crazy. So when I noticed that the Imagination Movers were embarking on a tour and would be coming to the Northwest in December, and knowing I was taking the month of December off, it was a no-brainer that we'd have to catch one of their shows. We actually kept it a secret from our girls the whole time, describing our four-hour drive to Seattle as being a trip to pick up a new engine for Mommy's car (which turned out to be a secondary reason we went there that day). Now, we travel enough to where our girls can have a fun experience with any time that we're on the road, and we're happy to play games and listen to music and talk about various things while driving for hours... but still, a trip to Seattle to get an engine just wasn't all that thrilling of a notion for them. So you can imagine their reaction when, after picking up the engine, we drove slowly past a theater where Becca noticed big letters on the marquee that read "IMAGINATION MOVERS - DEC 12". We played dumb at first... "Hmmm, what day is that? Oh hey, that's today. Whaddya know? Ah, but we would need tickets for that..." And then both girls sighed in a softly sad way... But then, well... let's just say that I'm still hearing echoes from the shrieks of joy that ensued when I pulled out the tickets and showed them. And as if the show itself wasn't incredibly fun enough, they got to meet Rich, Smitty, Scott, Dave and Drummer Kyle afterward. They were able to discuss important things like Webkinz with the guys (apparently, Dave has 12 Webkinz at home... I'm not sure how many are his, though) and even sang a verse of the Plants vs. Zombies theme song for Mover Dave. Needless to say, it was a very memorable day, and the guys were tremendously generous with their time and super-nice and friendly, as you would only expect from watching their show. 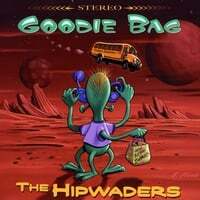 The Hipwaders are definitely one of the coolest "kindie rock" bands to emerge in the last several years. 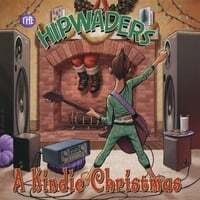 This was an interesting year for the band in that they had two releases, both a little different than the norm; the first was Goodie Bag, which is a Hipwaders record through and through, but only with an EP's worth of songs, and the second is Kindie Christmas, an album of all original Christmas songs with the Hipwaders' sound and style. Check out the videos below for "Field Trip" from Goodie Bag and "Santa's Train" and "Wake Up" from Kindie Christmas. Though their three-piece lineup has morphed a bit during that time, singer-guitarist-songwriter Tito Uquillas has always remained at the helm. I'm thankful to call Tito my good friend, and our families have been able to meet up a few times now when we've been traveling through the area. We always have a great time talking at length and jamming a little and this last time we visited I did the following interview with Tito... Enjoy! 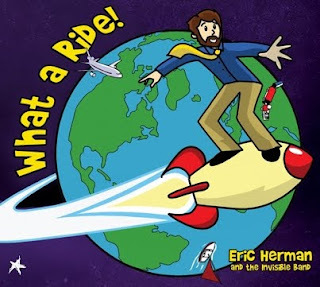 What a Ride!, my fifth CD of music for kids/families, was released back in June (man, I'm so behind on this blog...). The album includes 11 tracks and some guest appearances and performances by several awesome kids' music artists, many of whom I've featured here; Gwendolyn Sanford of Gwendolyn and the Good Time Gang, Tito Uquillas of The Hipwaders, Eric Ode, Robbi K, Chris Wiser of Sugar Free Allstars, Jim Dague of Scribblemonster, David Tobocman, Devon Thagard of Super Simple Songs, Glenn Colton and Mr. Billy. My wife, Roseann, and I produced this album together over the past two years, and though there is certainly no objectivity here, we think it's my best album yet and we're really happy with how it turned out. Well, the final master for the first run was a little different than for subsequent runs, since I noticed some things I wanted to adjust, sound-wise... We were pressed for time to get it to the manufacturer to have copies in hand by the release date and I believe I would have chosen a different mix/master to send in for that if I'd had more time to review everything. But that's all fixed for future runs. The album as it was sounded good, just the perfectionist in me wanted a few tonal changes here and there... Regardless, I've always been very happy with the music that's on the album. I would say that What a Ride! is less comedy oriented than albums like Snow Day! or Monkey Business, and it probably skews a little older in general than my previous albums, but it has a really nice variety to it, and thematically it loosely depicts the journey and growth of childhood and the exploration and illumination involved with that. The album also includes some of my very favorite songs from among my catalogue, specifically "Stink Bug", "What a Ride" and "How Big". "How Big", in particular, came out better than I could have hoped, especially with the soaring outro vocals by Robbi K and the chorus of friends and family on the outro refrain... I don't know if any song could really begin to describe or depict the unimaginable immensity of life and the universe, but "How Big" does give me a little bit of the feeling of that, which is what I was aiming for. We're currently working on a video for that, which will be fun to put together. You can listen to samples of all 11 songs at this page. There are also full songs to hear, including "Heartbeat (The Stethoscope Song)", "What a Ride" and "How Big", at my Facebook page. The video for "Ants in Your Pants #99" is below, as well as the compilation video from a video dance contest we held on YouTube back in July. What a Ride! 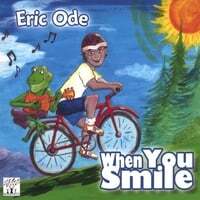 is available through my website, as well as at CDBaby, Amazon.com, iTunes and other major digital sites. Didi Pop has been embarrassing me. Her tunes are so catchy that I find myself singing them in public places, not even realizing I'm doing it. Normally, that wouldn't be so bad, even with a 40 year-old guy singing kids' tunes, but there's something particularly disturbing about singing a line like "when my diaper's drippy, it hardens up my poo" and realizing by the look on the grocery clerk's face that yes, I did sing that out loud. I'm referring to a line from the song, "B-R-A-T-Y", the video of which (watch it below) was my first introduction to Didi Pop, a children's artist from Los Angeles. For me, the song was an instant classic; amazingly catchy and upbeat, and so up front about its dietary/digestive message. I think we in the kids' music world sometimes shy away from songs that could be considered "preachy" or "messagey" (I don't think that's even a word... and my spell checker agrees... but I've heard it used a lot in this genre), or we try to be so subtle about it that any message that is there is going to be too vague for a lot of kids to even appreciate. But Didi has nothing to hide on "B-R-A-T-Y"; if you eat certain foods, your bowel movements will be more solid. Pure information, sung so matter-of-factly and confidently with a bouncy "11 o'clock number" showtune melody that it becomes ingrained almost instantly. Now, if the message in "B-R-A-T-Y" was bad information, it could be dangerous propaganda... you wouldn't want kids going around singing "when my diaper's drippy, I should hitchhike to Reykjavik"... but as it is, the song is a perfect vehicle for its message. Didi has one of the best voices I've ever heard in the kids' genre; great range and tone and polished yet down-to-earth. At times she sounds a bit like other favorites of mine like Frances England and Gwendolyn from Gwendolyn and the Good Time Gang, so there's a familiarity about the general sound which is nice for what she's singing, but she also has very much of her own voice and style. If anything, Didi's singing approach and aura as a performer reminds me most of Mary Poppins; at times soft and sweet but often in-your-face brassy with a sly charm and wit that belies the messages she is planting. Her singing is one thing, but Didi is also a top-notch songwriter, giving a great vehicle to her voice and singing approach. "The Cool Alphabet Song" (see video below) at first seems like yet another attempt to supplant that famous alphabet song (which is not likely to happen in our lifetime), but it takes some really interesting turns musically and uses some clever letter devices (not unlike Ralph's World's recent "Abby's Alphabet Soup"). "Feed the Pet" is a cute calypso style tune and "Max the Wonderdog" a terrific Tin Pan Alley style tale. "Yellow Car" is an example of the depth and breadth of this album, as it was not an early favorite of mine and yet it's the tune I find myself singing in public places most often lately (which is much less embarrassing than "B-R-A-T-Y"). "Look at Yourself in the Mirror" is a super cool pop tune with yet another incredibly catchy hook; "Neferdidi" is a fun genie-in-the-lamp story with a great Silk Road sound; and "Monday" is a neat a cappela trip through the days of the week and other time-related measurements. The closing song on Didi Pop is called "Dream". "Dream" is not just one of the best lullabies I've ever heard, it's one of the most beautiful songs I've ever heard, period. This song has actually made me cry while driving down the road listening to it and thinking of how magnificent life really is (yes, more embarrassment if a trucker happens to drive by and see me bawling while listening to a lullaby!). The lyrics are fairly standard lullaby fare about rainbows and clouds and such, but there is something so deeply moving about the way everything comes together for me with the words and music and Didi's elegant singing, that I don't know if I can even express it adequately. When our Becca was a baby, we had a mix CD of different mellow songs (James Taylor, etc.) to play for her at bedtime, and it was nice for us to hear those songs coming through the baby monitor in our room. I'll never forget how one night, as I was drifting away into sleep, I barely heard "Canon in D" playing through the monitor, and with my eyes closed I could see this gloriously colorful world of music far away among the darkness of the room and of the night and of the world. It was a wonderful feeling and this song is one of the few things I've heard since then that has touched into that same kind of spirit. 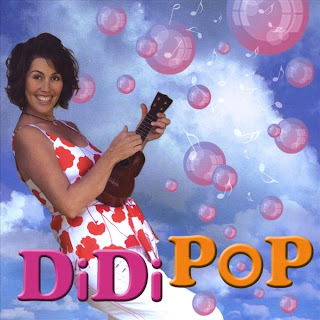 I couldn't talk about Didi Pop's album without mentioning what is perhaps its greatest weapon of all... Delilah. Delilah is Didi's daughter, three years-old at the time of the recording, and she may be the cutest sounding little kid I've heard on any children's CD (and I've heard some cute ones!). She interacts wonderfully on songs like "Feed the Pet" ("feed a Dinah Shore!") and "Merci" and pops up in a few spots here and there, and I would have liked to hear more of her on the album. My advice to Didi is to take Delilah into a studio and record her for several hours saying various different things, so she'll have a backlog of cute Delilah recordings to use for albums to come, though I'm sure she'll still be very cute sounding for at least a few more years. But you don't have to take my word for any of this... Didi has generously offerred her entire album to listen to for free on her website at this link: http://www.didipop.com By all means, go there and listen, but be forewarned, you may find yourself belting out her tunes in public, and if so, well, I hope you don't get embarrassed too easily. It's amazing how with all of the kids' music I've heard since starting this blog (and before that), I am still often blown away by new things I hear... And every so often, I'm blown away even beyond any normal standards of what constitutes being "blown away". Gunnar Madsen's I'm Growing album is a perfect example of that, and is without a doubt one of the most entertaining kids' music albums I've ever heard. I'm Growing may not be to everyone's taste (not that anything is)... it is at once adventurous, over-the-top, complex, goofy, challenging and diverse, and it might be a little too much for anyone looking for a more straightforward sing-a-long kind of CD for their kids. But if you can just let it play and be open to discovering its creativity and uniqueness, then a real musical treat awaits, to be sure. The opening title track builds up to arrive and envelope you. Instantly, Gunnar's vocal and arranging virtuosity is evident (he might be considered the kids' music equivalent of Bobby McFerrin) and you know you're in for something really special, and the rest of the album delivers a tasty smorgasbord of musical and lyrical ideas. "Pumpkin Hair" takes a simple, folksy kind of barn dance rhythm (think the New Main Street Singers from A Mighty Wind) and spices it up with some unexpected chord changes. "Walkin' Back to Texas" seems to channel 70's laid-back folk-rock tunes like Mungo Jerry's "In the Summertime". "Sun Comes Up" bounces along with some clever odd-timing and fun vocal play. "Mozart's at the Window" is a tour-de-force of vocal harmonies and layering. "Always on the Bottom" is a catchy and funny Elvis-style tune that scores extra credit for rhyming "bottom" with "Hillary Rodham". "Simple" belies its name by including some sophisticated lyrics and chord changes in a cool tongue-in-cheek way. "Library Closing Time" is a party rock anthem with a great rhythm pickup and the classic line: "Dewey Decimal? Yes, we do." The album ends with the beautiful original track "Tonight" and a stunning rendition of the traditional standard "Shenandoah". Much of I'm Growing sounds familiar, musically speaking, and yet it's so fresh and original that it is always unmistakably "Gunnar Madsen". I'm reminded of the quote I used to describe Frances England's first CD, where Leonard Bernstein referenced good art as being "fresh, but inevitable." Gunnar's other children's music CDs, Old Mr. Mackle Hackle and Ants in My Pants, and his composing efforts involving waltzes and synthesized dramatic works all have the same sense of unique brilliance and variety. But I'm Growing reaches musical heights even farther reaching than his previous children's albums, and stands out as a groundbreaking recording in the genre. Click here for song samples, lyrics and ordering information for I'm Growing. I was happy to be able to meet up with Gunnar at his home last year and interview him about I'm Growing and the rest of his work, but I've had some trouble getting the interview transcribed... It's almost complete now, though, so I will try to get that posted sometime after I'm home again in May. I think the producers of this CD did themselves a disservice by naming it what they did... Presumably, it was meant to be a CD of mellowish classic rock covers for babies to chill out to, but the songs are sophisticated (the Pretenders' "Brass in Pocket" as an "I need some attention!" kids' song was a particularly brilliant choice) and the singing and arrangements are beautiful and contemporary, and my girls (aged 6 and nearly 4) play this album repeatedly in their bedroom while loudly singing along. So by all means, ignore the title, as this is just a great record for any age, really. According to the press release this is supposed to be a CD for parents, moreso than kids, which is presumably why they left ScribbleBunny and even ScribbleMonster himself off of the album in favor of the human voices of Jim and Jayne and Joyce. 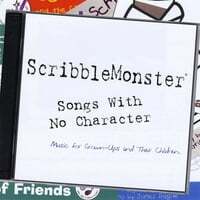 But I think most of the songs still work very well as kids' songs, so regardless, it's a really great ScribbleMonster album. Highlights include the Motown rocker, "Doing the Right Thing Isn't Always Easy, Doing the Easy Thing Isn't Always Right"; the hilariously awesome "I'm a Utility Pole (The World's Worst Dance Song)"; the incredibly touching board game metaphor, "The Game of Life"; and the great "look for the silver lining" message of "It Could Have Been Worse" (co-written with Monty Harper). I do miss the ScribbleMonster "fill-in-the-blank songs" from their previous CDs, but still, this a very entertaining album, through and through. After five listens through, Pop Fly hasn't attached itself to me the way Justin's previous Meltdown album did after the first or second listen, but the fact that I've listened to it five times through should be indication enough that by any reasonable standard for kids' music, it's a really great album (and another favorite of my girls'). The opening title track is quintessential Justin Roberts; adventurous, melodic, memorable, wonderful... and though the rest of the album doesn't quite reach the same heights as that song does, there are several other gems, including the funny and folksy "Henrietta's Hair", "Field Trip" (complete with Roberts' signature v-v-v-vocal lines and "whoa-oh"s) and the ultra-smooth "Kickboard, Baby, Yeah". Though similar to Pop Fly in that it doesn't live up to the expectation created by its enormously awesome predecessor (Green Gorilla, Monster and Me), Rhyming Circus is still a solid entry in the genre. Ralph seems to use quite a few "hey, look at my Beatles reference!" references on this album, but the songs are very original and fresh, nonetheless. The rock anthem "Gotta Be Good" is my new favorite Ralph tune, and would probably be a hit for John Mellencamp, and other favorites are "Abby's Alphabet Soup", which nicely demonstrates the different sounds of each letter; "Do the Math"; "Finger is the Singer"; and "Edward, the Tap-Dancing Elephant". Video for "The Tale of the Sun and the Moon"
My latest video, for "The Tale of the Sun and the Moon", has been uploaded to YouTube. You can check it out below, though I recommend clicking through to YouTube to click on the "watch in high quality" link, where the video quality will be better and the audio will be in stereo. Enjoy! This fall, Trout Fishing in America released their 15th CD (yes 15th! ), Big Round World, and as a big fan of the duo for the last several years I was happy to discover that it is my favorite of all their albums so far. When a band or artist has released that many albums, you always look forward to the new release, and oftentimes you really like it because it's a group whose musical language you can identify with and appreciate, but it becomes harder after so many albums to really define things like "favorite" or "best". If anything, you might often be into the current album the most because it's the newest one and it's fresh. But in this case, I really think this is Trout Fishing's strongest album yet, which is saying a lot, considering how much I like their previous albums. And it was just announced last night that they have received their fourth Grammy nomination in the Best Children's Album category for Big Round World. The opening title track is immediately identifiable as "the Trout Fishing sound", with chugging acoustic guitars, bouncy rhythms and Ezra's big, round voice singing a memorable song about our big, round world. "My Favorite Jeans" covers more of a rock sound with Keith belting a funny ode to his favorite jeans, which leads nicely into "When You Get Dressed", a reggae/ska flavored track which may be the catchiest Trout tune I've heard yet. Ezra dispenses important advice such as "You don't wear a ski mask to the bank, or an evening gown to drive a tank". Other highlights (among many) include "Martin Luther King and Rosa Parks", a terrific inspirational anthem; "Too Good to Be True", a funny story with cool saxophone and upright bass accompaniment; "Curse of the Spinach", which cleverly describes the downfall of that formerly revered vegetable; and "Five", the album closer which beautifully describes how we all were once (or will soon be) five years old. I probably should have done this a few months ago, but at this point I really need to officially close submissions for this blog. I already have way too big of a backlog as it is, and very limited time to devote to catching up on it. It used to be that I could at least listen to every CD that was sent me, and then feature what I could from them, but I've actually had quite a hard time keeping up with even listening to everything that I've been sent over the last several months. I feel terrible about that, and apologize if your CD happens to get missed when I finally get more caught up on things. I know that I've never promised that I could cover everything, anyway, but I really hate to have anybody send me CDs without even an expectation of them being listened to. So I need to draw the line and request that no new CDs be sent. If there is something in particular that I want to check out, I'll specifically make contact and ask for a promo copy, at which point I will promise to definitely cover that CD. And with that in mind, please don't ask me to listen to something to see if I would want to request a promo copy... I really need to be fair to the people who have already sent actual CDs and make sure I've covered what I can from them first. The good news is that I have started working on some articles again recently, and have several things coming up, including interviews that I've mentioned before with Gunnar Madsen, Ezra from Trout Fishing and several others. And also, though I'll certainly be well behind with some of the newer things coming out (which I've always been, anyway), I've got quite a lot of great stuff to cover from the CDs I already have that will keep me busy enough for quite a while. I will take my hat off to others who have been more consistent in keeping up with posting about kids' music (see my links below). Speaking both as a kids' music artist and as a fan of the genre, I really appreciate that. Unfortunately, I haven't even been able to read a lot of the kids' music blogs this year (I had to shut down my Google Reader during a particularly busy stretch, and I've only recently started adding back some things...), so I definitely feel out of the loop a bit. But you don't have to feel out of the loop like me, with others staying on top of things. So it's been over three months since I've posted here, and I'm really sorry about that. I'm sure Brady Rymer hasn't minded having three months of "first post" coverage, but for the rest of you, I apologize for the lack of updates. I've just been super busy with recording and traveling and other stuff and I found it really hard to find the time to write up anything when traveling. On many days it was hard to keep up with the travelblogue, even. But anyway, I am going to do my best to get caught up here, and the cool thing is that I have a nice list of things to add, including several interviews and many new CDs to cover, but that will mean that I'm going to have to keep it brief and mostly stick to capsule posts. There's probably a collective cheer going out, as my posts are probably too long as it is, but the thing is, in many cases I just prefer to write "articles" as opposed to writing something more succinct. If I'm going to write about something, then by golly I'm gonna write about it. The Imagination Movers are a four-piece band from New Orleans, and they make an ideal subject for a transition into doing more "capsule" sized posts, because I'm not all that familiar with them or their music, so there can't really be all that much for me to write about. I had been aware of them vaguely for a few years and liked the few song clips of theirs that I had come across online here and there, but I didn't really have a lot to go on until seeing their new show on Playhouse Disney. We decided to check it out when it debuted and it's quickly becoming a favorite of my girls and I think it's a really fun show, too. The Mover guys have a lot of charm and do a great job acting and performing on the show, and the show itself exudes the light comic feel of The Monkees. There's not an abundance of humor, but there definitely are some comic moments throughout every show, which automatically jumps it ahead of The Wiggles TV shows and videos. I've always been a fan of The Wiggles' music, but the content of their shows and videos have seemed lacking to me in terms of comedy. Sure, they're geared toward very young kids, but other shows like Sesame Street always found ways to appeal to that same age group with a lot more comedy included (meaning both kids comedy and adult comedy). The Imagination Movers have a similar appeal as The Wiggles, though they are probably aimed more toward preschool and lower elementary aged kids, as opposed to the toddlers that The Wiggles are probably a better target for. The show depicts the Movers (Scott, Smitty, Rich and Dave), their puppet friend, Warehouse Mouse, and their (well characterized) boring neighbor Knit Knots and his niece, Nina, as they try to solve various problems using basic problem solving and imagination (a subject I've always been very interested in). And though I've only seen a few episodes, I've already been hooked on their music from the show. It's very straightforward pop and rock, with a little funk and not-too-terribly-bad-for-kind-of-dorky-white-guys rapping thrown in, and the hooks are quite strong and memorable. There's a vibrancy and fun to their sound that reminds me of bands like BNL and the Mighty Mighty Bosstones, as well as some funk-rap akin to the Red Hot Chili Peppers. My favorite songs so far include the opening "Imagination Movers" theme song (don't you miss theme songs on TV shows?? ), the rockabilly-esque "Brainstorm" anthem, the super catchy and bouncy "Jump Up" and the upbeat countrified "7 Days a Week". Now that I've been introduced to the Imagination Movers through their TV show, I look forward to hearing more of their great music. I hope the show is a big success for them! 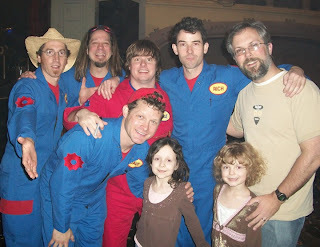 You can hear several Imagination Movers songs and see some videos through this link on their website.